Many businesses from small to medium companies to large enterprises are using Amazon Web Services (AWS) to host their infrastructure. But creating, keeping track of changes, and managing your infrastructure can be challenging. Replicating your entire stack multiple times for development and testing purposes can be a tedious, error-prone, and time-consuming process. AWS CloudFormation makes it easy to create, provision resources, and manage the replication of your infrastructure. In this blog post, we show you how to easily create, scale, manage or upgrade your JFrog Artifactory cluster using our customized CloudFormation template in less than 30 minutes. CloudFormation is a service that helps you model and set up your AWS resources and allows you to deploy resources like virtual machines, networks, databases, storage, users, permissions, custom applications, and security appliances on the AWS cloud platform by writing software instead of clicking buttons. A “CloudFormation Template” is a text file written in a specific format that defines the AWS resources you want to create and AWS CloudFormation takes care of provisioning and configuring those resources for you. 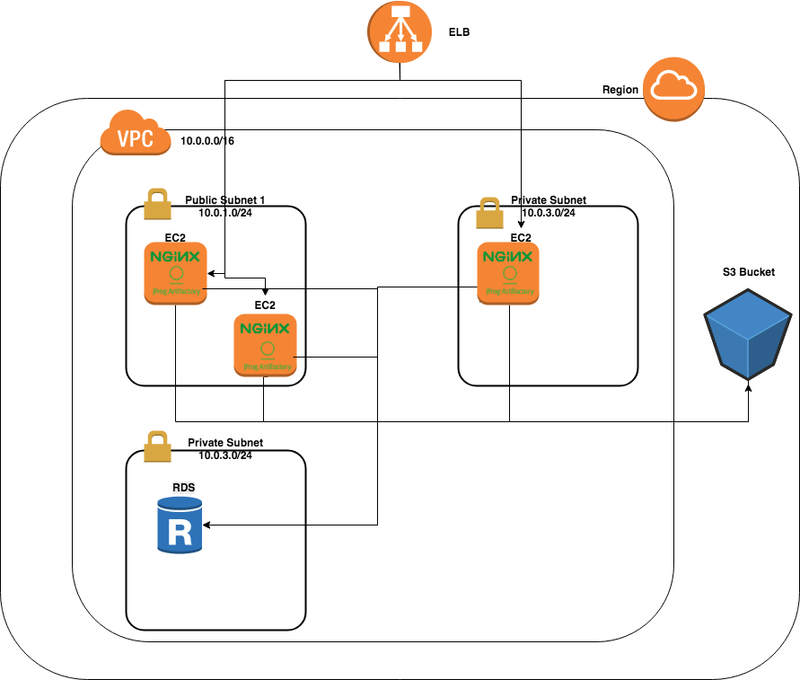 Why Deploy Artifactory Using AWS CloudFormation? AWS CloudFormation provisions your resources in a safe, repeatable manner, allowing you to build and rebuild your infrastructure and applications, without having to perform manual actions or write custom scripts. CloudFormation takes care of determining the right operations to perform when managing your stack and rolls back changes automatically if errors are detected. Step 1: Go to AWS Console> Services> Management Tools> CloudFormation and click Create New Stack. Step 2: Upload the Artifactory Enterprise template to Amazon S3. Step 3: Pass the parameters. Step 4: Create the stack. Step 5: Access Artifactory using the Artifactory ELB URL provided in the Output section. To learn more about how to fine-tune your Artifactory deployment to accommodate your specific requirements, see the JFrog Cloud Installers area. Now that your Artifactory is up and running in AWS using CloudFormation, it’s time to rock and roll!